This is another film project I'm working on. With the 100th anniversary of the sinking of the Titanic approaching very quickly, the question arises- what can we learn from what happened on that "Night to Remember"? Evolution says that we have no inherent value, and that the death of the weak leads to the development of the species. If we are all simply products of evolution, matter-in-motion, and the strong survive and the weak die, then "women and children first" is nonsense. Rather, "strongest first." Women and children last. For the sake of the species, you know. Egalitarianism denies any distinctions between men and women. Anything men can do women can do better. 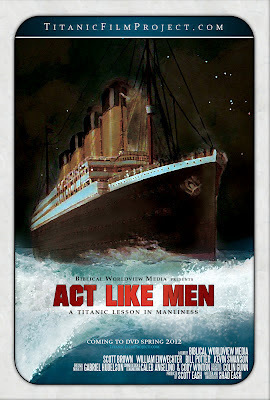 I have yet to hear, however, a feminist be truly consistent and say that the men on the Titanic were being chauvinists. After all, they apparently viewed women as weaker vessels. Why didn't they just let the women take care of themselves? If these worldviews are allowed enough time to eat into the marrow of our culture, we will gradually, eventually, see their ramifications played out before our eyes. We're seeing it now. Recently, our military has finally been given permission to put women in the front lines of combat. Egalitarianism marches on. Let it march on long enough and maybe I won't have to wait on the women and children before I get my chance to get off the sinking ocean-liner. Maybe I can feel good about myself as I listen to the screams of the women and children who go down with the ship. She didn't want me to hold the door for her- why should I hold the seat on the lifeboat for her? Can't they take care of themselves? No. I can't feel good about it. No matter how boldly these poisonous worldviews march forward, I am a Christian, and as such I see it as my duty as a man to lay down my life for women and children. Whether it's taking a bullet or not taking a life vest or carrying an overburdened purse, I rejoice in the calling that is mine as a man- to not struggle for supremacy in a chaotic melee of natural selection, but rather to use the strength that God has given me for the benefit of those who are weaker than I. Primarily, because that's what Scripture says (John 15:13, Neh. 4:14, Eph. 5:25) and models (Jas. 1:27, Ps. 82:3). Another reason is encapsulated in this quote from the Mysterious Islands documentary: "Evolution is survival of the fittest. In Christianity, the most fit of all, Jesus Christ, died for the unfit. That's you and me. That's the way God thinks- that's the way the Creator thinks." Because that's what Jesus did for me. Here's a taste of the score for "Act Like Men." Watch the trailer and keep up with the film's progress on the website. "...when the most fit of all, Jesus, died for you and me. That's how God thinks - that's how the Creator thinks..."
"For when we were still without strength, in due time Christ died for the ungodly." Keep posting these sorts of things! Very good verse! Thanks for bringing that out. Grace, I thought I embedded a SoundCloud player in the bottom of the post. I'll check that. It should be there for your listening enjoyment by the time you read this. "Anything men can do women can do better." Yup. See, they don't really want 'equality'...they want supremacy. And I know why. The curse found in Genesis 3:16. On women on the frontline...I'm an Army brat. I happen to know that women in the military at all in not a good idea. 1)It is not her God-given role (at the same time I see nothing at all wrong with every woman knowing how to defend herself :) ); 2)women in the military cause promblems within units (of a sexual nature); 3) women are weaker--guess what? Training and PT standards got lowered. Nice post, hit the nail on the head. Funny you should post this right now, I am working on a review of the new movie "Act of Valor", and this topic was brought up (in my mind) through the movie. The crooks in this movie are Muslim activists who have no qualms putting bombs in the hands of women to stop the soldiers coming through, whilst they tuck their tails between their legs and escape. Women are to be protected, honored, and valued, not turned into living landmines. It is one of the primary roles of men to protect women, and the culture has got it all wrong. From women on the front lines, to them being bombs, our world undervalues women for the gift they are. Check out my review when it comes out! I've heard some not-so-great things about that film, so I'll be interested to hear your thoughts! Bravo. Excellent thoughts, Gabriel. Thankyou for sharing them. I had never thought of the "women and children first" statement in the light of what Jesus did for us as the unfit, but now that you have pointed it out, it is most obvious. Corey, no, not RT. I heard that the two antagonists in the films were Jews and it was basically a pro-Muslim film. Ah, I see. :) Whoever watched the film and said that must not have been watching it very carefully. Act Of Valor is as about politically-incorrect as they come. I seem to recall one of the villains having a Jewish origin, but it's clear that he's abandoned all ties to his former heritage/faith. Plus, the primary bad guys are Islamic fundamentalists, plotting a terrorist attack on the U.S. A pro-Muslim film? Nothing could be further from the truth. Aha. Eeenteresting. Vee shall see. Awesome!!! Very vell don possst! Love You! And George Orwell couldn't have done better! Where I come from, Renata, anyone opens a door for anyone else, if they're going through a door first. Gabriel, saw the film some time ago. Loved it! Amazing job.